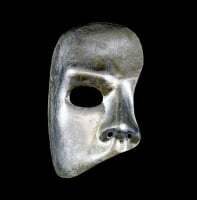 Be locked in your designer credentials with this ultra-stylish Decor Era Masquerade Mask in Silver White at simply Masquerade. It is perfect for translating your fashionable attitude at all times. This gorgeous party mask features a contemporary silver swirls on a silver / bianco white hand painted painted base & features a silver/multi-coloured braid edged detailing for ultimate style. 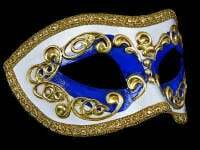 With soft sheen black satin ties this mask is perfect for your next masquerade party, wedding, prom night or Venetian masked ball. 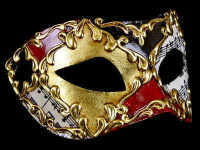 This mask has been made by hand & painted by the best mask makers in Venice, Italy....Certified authenticity.